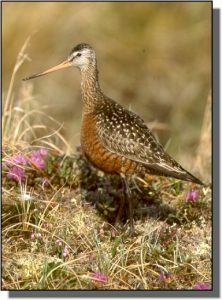 Description: This pigeon-sized shorebird has long, dark legs and a long, slightly upturned, two-toned bill. Look for a black tail, white rump, and dark redbrown to buff back mottled with black. The underparts are dark reddish to pale buff or gray depending on the season. They have an obvious dark loral stripe and white supercilium which runs from bill to eye. In flight, the white rump patch, contrasting dark tail, white wing “windows” seen above and the predominantly black underwings are diagnostic. Similar Species: Marbled Godwits in flight are distinctively cinnamon to light brown. Long-billed Curlews have long, decurved bills. Willets are smaller, stockier with straight, heavy bills and blue legs. 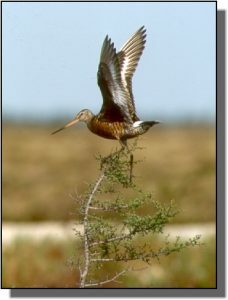 Dowitchers are also smaller with straight or slightly down-tipped bills and shorter legs. Comments: Hudsonian Godwits breed in the taiga and winter in Argentina and Chile. They have an elliptical migration pattern and are commonly seen during spring migration within the Great Plains on mudflats, flooded fields, lakes and reservoirs. During the fall, they stage along the Hudson and James bays and migrate south across the Atlantic Ocean and are uncommon inland.